Time To Cry For Argentina? Two issues - apart from the exceptionally high levels of recent economic growth which have been achieved recently - seem to have dominated the economic landscape which formed the backdrop to Argentina's latest election: the price of tomatoes and the availability of energy. In many ways this preoccupation with tomatoes seems to be a good example of one of the defining features of Argentine social and political life, an obsession with detail - and the more exotic the detail the better - and in particular with detail over and above the big picture story. And while having a regular and reliable energy supply is far from being a mere detail, the price of tomatoes might well seem to be one. The devil, however, is always, or at least nearly always, in the details, and the devil, in one form or another, is never, it seems, very far away as far as Argentine politics goes. As outgoing President Néstor Kirchner is quoted as saying at one point "It's not easy work helping Argentina find it's way out of hell, but in these past four years we've shown that it's absolutely possible to do so". The moral is, it seems, that the devil makes hard work out of life, but he doesn't always win, unlike those who "adjust" the inflation numbers, who seem to do so eternally. In fact the really big, big news which lies behind the recent electoral triumph of Cristina Fernandez isn't the technique which has been so delicately refined in order to prune the inflation data, nor is it even to be found in the fact that earlier in the year many of the country's factories were brought to a virtual standstill by the need to maintain supplies to Argentina's domestic consumers (and of course voters) in the face of growing shortages. No, the principal "big picture event" which has marked this years electoral process is the fact that Argentina's economy has been expanding at a sustained annual pace of around 8% per annum over the last four years, and is, if anything, accelerating at the present time, since the Argentine economy reportedly expanded at the fastest pace in three months in August and was growing at an annual rate of 9.2%. Obviously the "China phenomenon" - if we can use the expression to characterise those emerging economies which now seem able to sustain very high levels of annual GDP growth (Turkey, India etc) - is something which now extends way beyond China. And the mention of China is not altogether incidental here, since it was by linking-in to China's growing need for agricultural products (and in particular for Soya) that Argentina first began to put the turn of the century crisis behind it. The question which we will ask in this post is whether or not recent growth in Argentina is sustainable, and whether in fact it is now something more than a derivative consequence of the China phenomenon itself. Of course the big issue here is just how significant and sustainable all this is. In the first place, and looking briefly at the GDP chart above, it is clear that the recent boom years have followed in the wake of a couple of very strong "bust" ones, so to some extent above-par growth was to be expected. So will the Argentine economy continue on its present stellar path or is the present inflation upsurge, as some would have it, a warning signal that Argentina lies on the verge of yet another of those hyper-inflationary spirals? 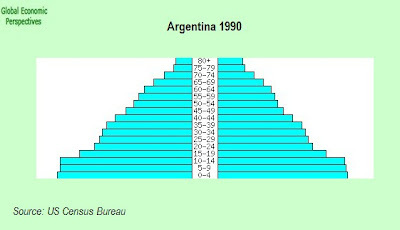 This is the question we will attempt to investigate here, in order to ask ourselves whether or not, and despite the fact that Argentina just clocked in at 85th place in the World Economic Forum's Global Competitiveness Index, there something different about Argentina's evolution this time round? And if - to anticipate a little - there are reasons for thinking that this time it may be different, what exactly those reasons are, since as I note, the World Economic Forum could find little to be happy with. 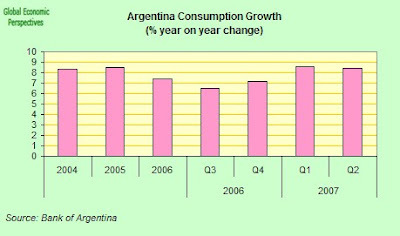 Certainly reasons why Argentina's "growth miracle" should not continue are hardly hard to come by. The first of these is the incipient rising inflation, and the government shenanigans in trying to hide it. The issue of food prices hit the headlines in grand style earlier this month when Argentine consumer groups launched a week-long boycott of tomatoes after prices reached almost $6 a kilo, making the salad vegatable which garnishes the nation’s dinner plates effectively more expensive than the meat it normally accompanies. The boycott itself took place amidst growing concerns about galloping food inflation and widespread criticism that the official inflation figures presented by the government were being manipulated as part of the run-up to this weeks elections. Food prices are now widely estimated to be rising at an annual rate of around 22.5 percent - or more than double the inflation rate which is to found in other sectors like clothing, or domestic appliances. The "say no to the tomato” campaigners handed shoppers a tomato in a bag marked "officially priced at 3.99 pesos ($1.30), don’t overpay”, an ironic reference to the official price recorded by Argentina’s much-questioned National Statistics Institute (Indec). Incumbent President Néstor Kirchner has defended Indec’s figures, most notably by describing them as "perfect”, but after months of apparent government manipulation of official data there are few who are still willing to swallow this. Independent economists expect inflation to end the year somewhere in the 15 to 20 percent region, or at double the rate which is to be found in the official government’s forecast. At the present time inflation is estimated by Goldman Sachs to be about double the official 8.6 percent rate, and the blame is put firmly on a 35 percent jump in government spending this year. 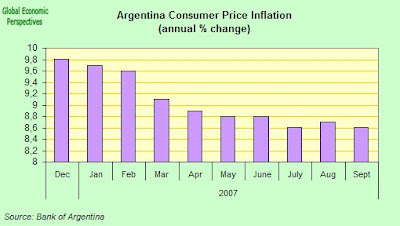 To back their inflation claims Kirchner's critics have been pointing to a breakdown in the traditional relationship between price rises in Buenos Aires, the province that the government uses to gauge nationwide consumer prices, and prices in Mendoza province. In the 10 years up to 2006, annual inflation in Mendoza, a wine-producing region located in the foothills of the Andes, was on average 0.4 percent higher than in Buenos Aires. That gap however swelled to 9.2 percentage in the first seven months of 2007. Indeed in August Patricia Gimenez, the head of statistics for Mendoza province, initially reported inflation as running at 3.1%, more than double the official 1.5 per cent month-on-month rate, but the figures were later modified by the National Statistics Institute to show the lower rate 1.5% rate, according to the newspaper Clarin, and the earlier figure was attributed to an administrative error. As can be seen below, according to the government prepared Indec data, inflation would actually seem to have been slowing in Argentina so far this year. Perhaps looking at the above chart we can see why Néstor Kirchner recently described Argentina's inflation data as "perfect". As he said "We don't say there's no inflation", we just say that it is coming down when it is in fact going up. The perfection here obviously lies not in the accuracy of the data, but in the fact that it is hard to observe the hand moving behind the screen. Argentine Factories Running on Empty? The second issue which has been bobbing steadily up and down in the background, and which has given lots of fuel to the Argentina "recovery" sceptics, is the state of Argentina's infrastructure, and in particular the preparedness of its energy sector. 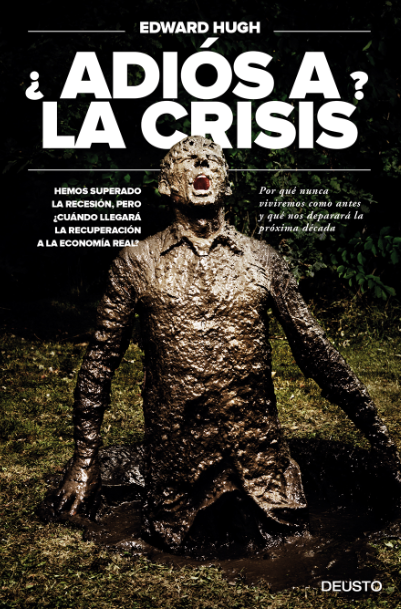 Last July, and for the first time, even Néstor Kirchner himself was forced to concede that a major problem existed to the extent that he actually used the term “crisis” to describe the severe energy shortages that Argentinians had been experiencing, shortages which in fact forced the government to ration gas supplies to the very factories which had been fuelling all that recent GDP growth in order to try to ensure that there was enough available for heating voters' homes. One of the complex threads which weaves its way through Argentina's current energy woes is, of course, the issue of climatic change. Lower than traditional rainfall has increasingly been causing problems for hydro-electric dams, and both Argentina and Chile have relied to some considerable extent on hydroelectric power to meet their energy needs. There are, however, other issues, among them the relatively high level of energy interdependence among Latin American countries, and the relatively high level of political instability which characterizes some of the countries concerned, most notably Bolivia and Venezuela. What all the interlocking and interdependence effectively means is that problems in one country are rapidly transmitted to another. At the end of June, for example, Argentina was only receiving 4.6 million cubic meters of the 7.7 million cubic meters of natural gas it needs daily from Bolivia. Argentina is not the only country affected by this situation. Whenever Bolivia cuts exports because of internal chaos (which is a not infrequent event), or because of technical problems caused by an investment deficiency (which are ongoing), then it is contractually obliged to service its Brazilian export contracts before it services Argentina. The resulting shortages then prompt Argentina to reduce its exports of Bolivian natural gas to Chile. Chile also is facing natural gas shortages, but cannot purchase directly from Bolivia because of the ongoing feud between the two countries over access to the ocean, which Chile took from Bolivia in 1884. Chile will soon construct liquefied natural gas ports to overcome its energy problems. Within both Chile and Argentina, residential consumption of natural gas (which in Argentina increased by a staggering 30 percent in May because of an early winter cold snap) is given priority over industrial use. This has led to shortages for power plants and factories in both countries, and also to the use of diesel and other petroleum-based fuels as a substitute for natural gas in those facilities capable of using multiple fuel types. That, in turn, has led to tremendous pollution problems, particularly in Santiago, and to diesel shortages that are affecting Argentine farmers during harvest (though the country's main crop, soy, has not been affected). But is ever the case with Argentine economics, domestic political questions are never far away in the background, in this case in the form of Argentina’s ultra-cheap energy tariffs, which have helped fuel the increase in demand at the same time as they have helped the economy bounce back from virtual ruin in 2002. 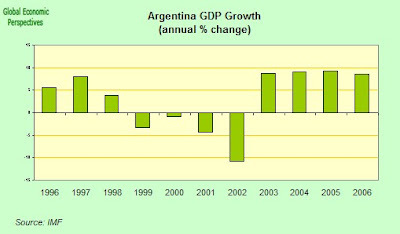 After four years of pretty spectacular GDP growth - averaging over 8 per cent per annum - Néstor Kirchner is now prepared to admits the dramatic economic growth has created "bottlenecks", but he has largely attempted to shift the blame onto energy companies for failing to invest enough to boost gas production, and transport companies for failing to deliver enough energy. From a more conventional economic point of view, of course, the issue of the government regulated tariffs lies behind the issue of the lack of investment. So while external factors undoubtedly played some part in the recent energy trauma which has shaken Argentina, to some considerable extent the problems have "made in Buenos Aires" written all over them. Since coming to office four years ago, President Nestor Kirchner has refused to lift price controls on utilities. These controls were originally imposed during the financial crisis of 2001-2002 to avoid social unrest, and afterward they were continued in order to give the appearance of controlling inflation. However, these fixed prices have discouraged new investment in the country's ample natural gas fields, leaving Argentina cripplingly dependent upon Bolivian imports, even as economic (and hence industrial) growth in the region exacerbates energy shortages. Although Argentina's natural gas production has increased over the past few years, it has not increased enough -- and most of the increases have not come from the opening of new fields, but from existing ones that are rapidly maturing and will soon "top out". On another front, the widespread suspicion that the government of Néstor Kirchner has been manipulating the inflation data and the likelihood that his wife Cristina Fernandez would succeed him have been steadily transforming the Argentine bond market. Argentina's benchmark inflation-linked bonds have fallen 24 percent in the course of this year, making the country's debt market the worst performer among any of the emerging economies, according to data compiled by JPMorgan Chase, and this has converted Argentine inflation-linked debt into the single worst long-term asset to be found in any of the emerging-markets. Yields on Argentina's 5.83 percent inflation-linked peso bonds due December 2033 have soared to 7.7 percent from 5.3 percent on Feb. 1, in other words since just after Néstor Kirchner started making those personnel changes in the statistics office in a drive to "perfect" the statistics. 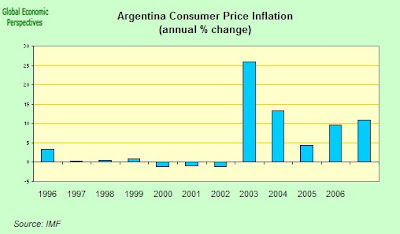 Now about 40 percent of Argentina's $136 billion debt is in inflation-based securities, and the value of their their principal rises and falls along with the consumer price index, so we can see here an immediate possible and plausible explanation for the growing obsession with inflation data. 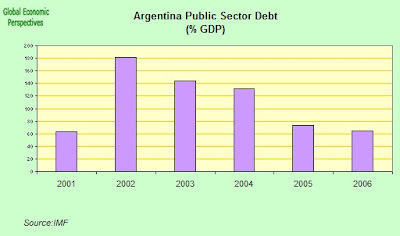 Merill Lynch estimates that the statistical "perfections" mean that Argentine bondholders may well have lost out on around $250 million in interest payments this year alone, and by steadily reducing the official rate the Argentine government stands to save something in the region of $5 billion in principal payments at maturity. Of course in electoral terms tampering with an index which should reflect the price of tomatoes is one thing, and tampering with it in order to reduce the size of overseas debt quite another. 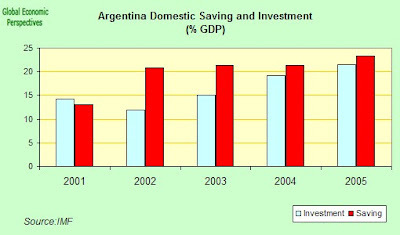 So whilst the polls show that most Argentines feel that consumer price increases are accelerating, and this obviously is a matter of concern for people who have lived through inflation which skyrocketed up towards the 20,000 percent level in the early 1990s, there are also other items on the household balance sheet which help to some extent to explain Cristina Fernandez's popularity. Reducing the level of debt payments abroad would be one of them. The level of unemployment, which has fallen steadily in recent years, would be another. Surviving The Emerging Markets Storm? In fact, despite the numerous tricky issues which arise in association with Argentina's sovereign bonds, the country itself, and its financial markets, have largely been spared the kind of problems which have been experienced in some of the other emerging markets like South Africa, Hungary or Turkey. 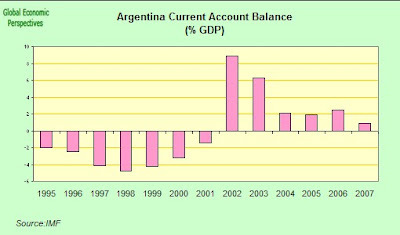 One of the principal reasons for this is that now – and in stark contrast to the situation which characterized much of the 1990s – Argentina's economy is largely protected against external financial pressures by the presence of budget and current account surpluses, and with these surpluses has come a steady increase in the country's foreign exchange reserves and a reduction in its external financing needs. Rather ironically, the poor reputation which Argentine national debt and institutional quality enjoy may have been more of an advantage than an impediment in recent years, since they have meant that the peso, rather than appreciating against the dollar as many emerging currencies have found themselves doing (the Brazilian Real for example), has in fact been trending slowly down. This situation is rather like running the late 1990s in reverse and has made it comparatively easy for the Argentine administration to maintain competitiveness and a trade surplus in the face of strong internal inflationary pressure. Put another way, the Argentina administration has not found it necessary to follow in the footsteps of some other (and currently rather more notorious) emerging market countries by adopting a currency peg (something which in any event would be unthinkable in Argentina following the experience of the late 1990s), since market sentiment has done effectively done the work of weakening the peso for it. 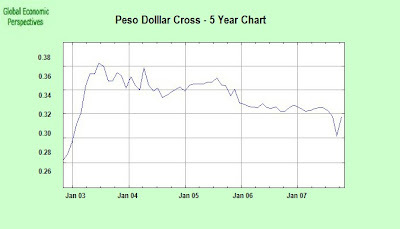 In fact the peso has fallen steadily against the dollar during the course of the last two years, at a rate which has to some extent been eating up inflation just as fast as the Argentine administration has been meticulously creating it, and all of this without causing any form of major financial disruption. Over at the IMF I can almost see the staff economists in tears at this point. And perhaps this is really why Kirchner describes the inflation data as "perfect", since such manipulation would seem to allow this process to go on and on, in a virtually painless fashion, while at the same time reducing the real value of the outstanding external debt . Or does it? It would on the face of it seem that Argentina’s real economy is much less vulnerable to external shocks than it used to be, and while it was affected - as can be seen in the above currency chart - by the last August's market turmoil, it has hardly been knocked off its orbit by it. 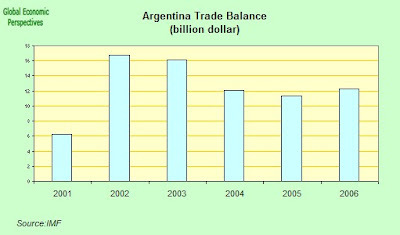 One part of the explanation for this is that the 2001 crisis had the consequence that there have been relatively few capital inflows into Argentina since the turn of the century, and indeed there have been net capital outflows in recent years, a situation which stands in stark contrast with the high levels of foreign capital penetration which existed in the late 1990s. The result is, naturally, that the level of external debt has been falling steadily. The level of outstanding public debt has also been steadily reduced, and the recent increases in government expenditure in the run up to the election have largely been financed out of revenue. In fact Argentina's tax revenue was up 37.4 percent in August 2007 when compared with August 2006, largely as a result of the fact that wages have been rising strongly (around 20% a year in nominal terms) and this has given a sustained impetus to consumer demand. Thus tax income in the year up to August 2007 rose to 17.9 billion pesos ($5.7 billion), up from 13 billion pesos a year earlier. Revenue from value-added taxes rose 43.3 percent to 1.8 billion pesos and income tax revenue grew 33.4 percent to 960 million pesos. So while government spending has increased significantly in this election year, the strong revenue inflows have enabled the administration to service the spending without increasing the level of public indebtedness. And unlike the situation in say, Eastern Europe, the boom in Argentina is hardly a credit driven one. Argentine banks only lend the equivalent of about 40 percent of their deposit base, a figure which is only around half the average rate now prevalent across Latin America. At the present time loans by banks equal about 11 percent of gross domestic product, and again this is down from the level of around 30 percent which prevailed before the financial crisis. 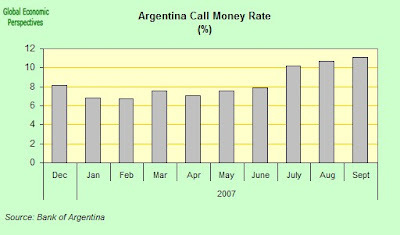 This apparent prudence on the part of the Argentine banking sector recently lead Nestor Kirchner to chide the banks, whose average credit card interest rate is roughly double that which is current in the United States, for example, by urging them to cut finance charges and lend more, vaguely threatening - in traditional Peronist theatrical fashion - that if they didn't act on his advice, then he and his government might be "forced" to consider introducing rules which ensured that they did. However, if we take the trouble to look at Argentine overnight interest rates, then we find that they are hardly high in comparison with those prevailing in some emerging markets, and indeed given the level of inflation which prevails (even on the official version) you might think there was some good justification for raising them (in Turkey, for example, the overnight borrowing rate is currently 17.25%, and in neighbouring Brazil where inflation is normally considered to be running at a little over 4%, central bank interest rates are currently at 11.25%). But the bigger point is that - no matter how much you "massage" the official numbers - it is evidently totally unrealistic to imagine that a commercial banking sector can offer rates of interest which fail to cover them for the real inflation rate which prevails. So while the central bank administered overnight rates are far from high, annual credit card interest rates, in comparison, rose to 26.85 percent on average in July, up from 25.93 percent last December. Rates for personal loans rose to 24.74 percent from 24.56 percent over the same period. By way of comparison we could note that the average fixed rate for credit cards in the United States is currently in the region of 13.5 percent. Well then, if Argentina is so badly governed, and infrastructurally and institutionally so far from being a shining example to others, what exactly is going on? Why should Argentina have done so badly at the end of the 1990s, when it was being a model student, and why should it be doing so notably well today, when on many counts it is doing exactly the opposite of what the textbook recommends. 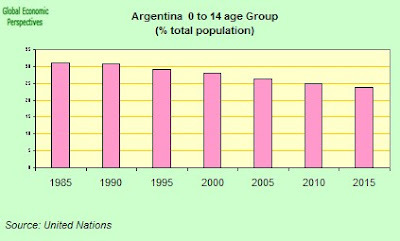 Well undoubtedly there are many reasons for this, and China's rapid growth and consequent demand for Argentina's agricultural products would be high on the list of triggers which set the party in motion, but if I could single out one factor which I think stands out above all the others it would come in a single word: demographics. So let's take a quick look at why. 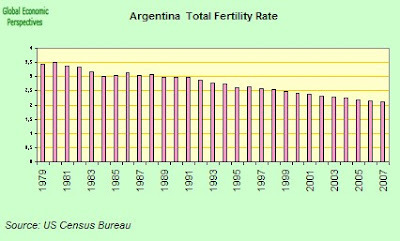 First off, and as is evident, Argentina's fertility rate has been falling for many years, and is now about to go below replacement level. This fall in the fertility rate has lead to a steady easing off in the rate of increase in the number of children born, and since 2000 the number has leveled off, and even begun to decline slightly. At the same time life expectancy has been improving, and most notably life expectancy among the young and poor, where we can note the steady decline in infant mortality which has again been taking place. 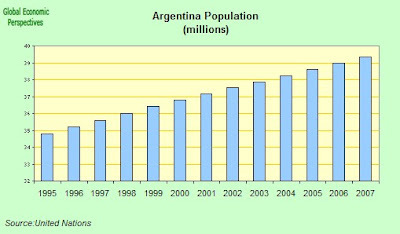 As a result of these processes Argentina's population is still increasing, but again at a much slower rate than hitherto. One consequence of all of this is that the percentage of the population in the 0 to 14 age group has been declining steadily from the high point reached at the end of the 1980s. 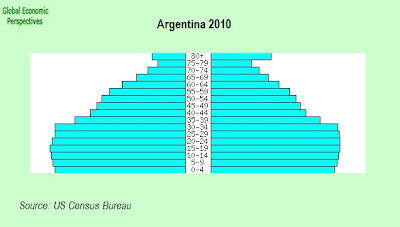 All of this is producing profound changes in Argentina's age structure, changes which are associated with what is known in an economic context as the demographic dividend. These changes can be seen reasonably clearly in the following population pyramids which are for 1990, 2000 and 2010 respectively. Looking at the pyramids we can see how their shape begins to change, and particularly in the third pyramid we should note how the steady stabilization, and then subsequent decrease, in the number of children born means that the generation size starts to shrink. 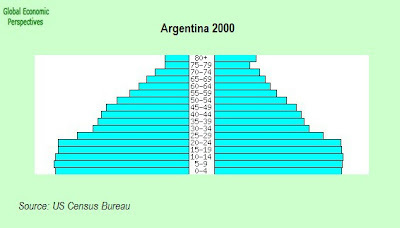 It is the appearance of this change at the base of the pyramid which is the most typical indicator of the presence of the demographic dividend. There are a number of reasons why changes in age structure affect economic performance, but one of the most important of these in the context of a developing economy like Argentina is the impact it has on saving and investment. Basically the relative decline in the proportion of young children frees off a greater proportion of national resources for saving and investment, and it is this process which means that the dependence on external funding begins to decline. A similar process has been observed in China since the late 1990s, and is now being observed in India. 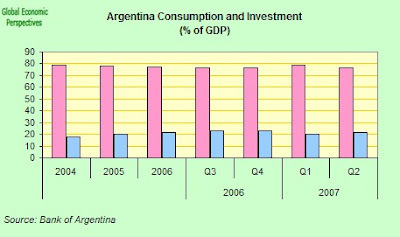 Also we can note a slight but perceptible decrease in the consumption share in GDP in Argentina in recent years from 78.5% in 2004 to 76,6% in Q2 2007, and a steady increase in the investment share from 17.8% in 2004 to 21.1 in Q2 2007. These are again features that tend to be noted as the demographic dividend works its way through and the declining pressure of immediate consumption which comes from a lower proportion of under 15 year olds frees off more national resources for saving and thus for investment. To Cry.... or To Laugh? So to end where I started, with the question - should we be crying for Argentina? My answer would be most definitely that we should not. There may be a lot - a hell of a lot - wrong with the way Argentina is being run, and some of the issues arising have been adressed in this post. 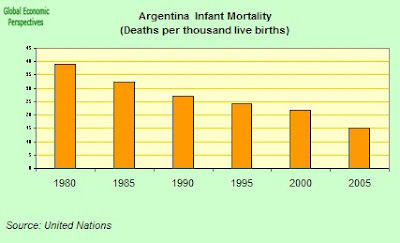 But the underlying situation in Argentina is far from being a tragic one this time round. History it sometimes seems is condemned to eternally repeat itself in Argentina, sometimes as tragi-comedy, and others as surreal farce, but there does seem to be a line of advance there, and this time round the line of advance might just lead to real economic development. Clearly Argentina needs to move away from such 'old-school' practices as manipulating the statistical system. And clearly Argentina also needs to move forward and attract Foreign Direct Investment in a greater quantity than hitherto in order to modernise its energy sector and indeed its infrastructure generally. But the present situation is far from being a hopeless one, and reform is not only possible but probable. Not only that, more by accident than design Argentina may go into the next global growth slowdown better equipped to be able to withstand the pressure than many others. If so this will also be a test, a test for the relative importance of institutional quality when measured against the driving force of demographic tailwinds. The outcome of this test promises to be interesting, most interesting, and for all of us. Argentina goes to the polls for a general election - or a coronation? The Republic of Argentina holds a general election on Sunday, October 28, 2007, to choose a new president and vice-president. Voters will also elect one-third of the Senate and half the seats in the Chamber of Deputies. In each of the eight provinces holding Senate elections, upper house mandates will be allocated on a two-to-one basis between the largest party and the runner-up. Meanwhile, Chamber of Deputies seats will be distributed on a provincial basis by proportional representation; National Elections in Argentina has further information about the country's electoral system and political history. In addition, most of Argentina's twenty-three provinces will hold provincial legislative elections; eight of these will also have gubernatorial elections, among them Buenos Aires - the country's largest and most populous, housing over a third of Argentina's thirty-nine million inhabitants (and surrounding but not including the national capital of the same name, which is a separate autonomous city). Outgoing President Néstor Kirchner has chosen not to run for re-election, and voters will have a choice of fourteen formulas spanning the entire political spectrum from far right to far left. That said, one candidate is regarded as the clear front-runner: Senator Cristina Fernández de Kirchner of the ruling, Peronist-oriented Front for Victory. Although she also happens to be Kirchner's wife, Argentina's first lady - known simply as Cristina - is no stand-in for her husband: she is a politician in her own right, with a forceful personality and nearly two decades of experience in elective office, first as a provincial deputy in the Kirchners' home province of Santa Cruz, and since 1995 as a national legislator, most recently as Senator from the province of Buenos Aires. Unlike most Latin American nations, Argentina is a fully developed and relatively prosperous country with an overwhelmingly white population, largely descended from European immigrants (mainly from Spain and Italy). However, the South American nation was plagued by political instability for most of the 20th century - between 1930 to 1976, the armed forces overthrew civilian governments a half-dozen times - and the country's economy has experienced frequent boom-and-bust cycles. Since the end of World War II, the Peronists and the Radicals have been Argentina's major political forces, and the two parties have alternated in power since the restoration of democracy in 1983. The populist Peronists - formally the Partido Justicialista or Justicialist Party - have been largely sustained by the urban working class, particularly the labor unions that flourished during the first presidency (1946-55) of Juan Domingo Perón, the party's founder and long-time leader. Meanwhile, the centrist Radicals - in full, the Unión Cívica Radical or Radical Civic Union - historically drew their support from Argentina's large middle class. However, the severe economic crisis of 2001-2002 - which left a majority of the country's population living in poverty - practically wrecked the party system, and both major parties split into numerous factions. For the 2003 presidential elections, the Peronists couldn't even agree on a single candidate, and three party leaders ran against each other for the presidency: former president Carlos Menem (who pursued a neo-liberal economic policy of privatizations during his tenure in office from 1989 to 1999), Santa Cruz governor Néstor Kirchner and former San Luis governor Adolfo Rodríguez Saá, who had briefly served as interim president in late 2001 (during his brief tenure, the country defaulted on its large external debt). Although Kirchner came in second place in the first round of voting, right behind Menem, the latter withdrew from the runoff election when opinion polls indicated Kirchner would win a landslide victory. 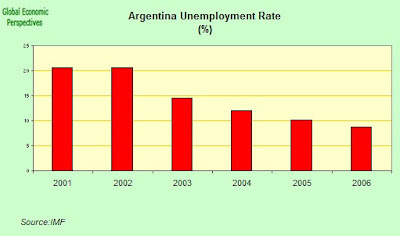 Consequently, Kirchner was declared the winner by default. Under Kirchner's presidency, the economy has staged a remarkable recovery, and the percentage of Argentinians living in poverty has declined markedly. 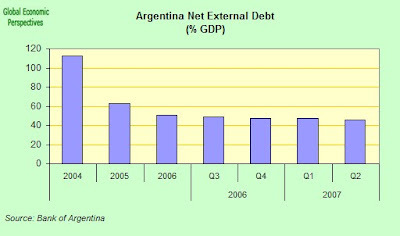 In addition, Argentina restructured its external debt. Cristina Fernández is running on the ruling party's record of strong economic growth, and opinion polls suggest she could easily win the presidency in the first round against a weak and fragmented opposition, becoming Argentina's first elected female president. However, in the weeks preceding the election a controversy erupted over the soaring price of tomatoes - a main salad and pasta sauce ingredient in Argentina - which was not reflected in official economic statistics that continued to show a much lower figure. While Kirchner's government belatedly stepped in to reach a price agreement, a consumer boycott appears to have effectively driven down prices. Not surprisingly, recent polls show a slight decline for Cristina Fernández, but she retains a commanding lead over the other presidential candidates. Her authorized biography is titled "Reina Cristina" (literally, "Queen Cristina") and the absence of a credible challenger has led some commentators to remark that the upcoming vote won't be so much an election as a coronation. While comparisons have been drawn between Eva Perón - the late president's charismatic second wife - and Cristina Fernández, the latter insists her political role model is U.S. Senator (and former first lady) Hillary Clinton, who also aspires to become her country's first female president. At this juncture, the only race that seems to be taking place in the presidential election is for second place. Former national deputy Elisa Carrió, a liberal Christian backed by the Civic Coalition, and former Economy Minister Roberto Lavagna of An Advanced Nation party appear to be the strongest candidates after Cristina Fernández, while former cabinet minister Ricardo López Murphy of the Recreate for Growth party and Alberto Rodríguez Saá of the Justicialist Liberation Front are further behind. Both Carrió's party, Affirmation for a Republic of Equals and the right-of-center Recreate for Growth are Radical offshoots; Lavagna, a self-described centrist, is supported by what remains of the Radical Civic Union (along with dissident Peronists), while Rodríguez Saá defends "traditional" Peronism. If none of the presidential and vice-presidential formulas wins at least forty-five percent of the vote in the upcoming election, or at least forty percent and a ten percent lead over the formula arriving second, a runoff election will be subsequently held between the top two formulas, and the formula with the largest number of votes will be declared the winner. The ruling party is anxious to avoid a runoff, in which opponents of the government may coalesce around the second-placed candidate to bring down Cristina Fernández. A large number of mostly older Argentinian voters remain reluctant to support a woman president, in no small measure because of the bitter memories of Perón's third wife, María Estela (Isabel) Martínez de Perón, a politically inexperienced former cabaret dancer who succeeded her husband as president when he died in office in 1974. Her brief presidency, characterized by spiraling political violence and runaway inflation, is generally regarded as an unmitigated disaster that precipitated the 1976 coup and the ensuing "dirty war," in which as many as thirty thousand Argentinians were victims of forced disappearances carried out by the military government. While gender would not be an issue in a runoff between Fernández and Carrió - who was Argentina's first major female presidential candidate in 2003 - a Fernández-Lavagna runoff would be a different story, all the more so as Lavagna is widely regarded as the architect of Argentina's miracle recovery during his tenure in the Ministry of Economy from 2002 to 2005. However, the prospect of a runoff election remains unlikely, and Cristina Fernández appears set to be elected (or crowned?) president next October 28. In any event, one thing is certain: no one will be throwing tomatoes over the election outcome - they remain too expensive. A total of 19,101,819 valid votes were cast in the election. Mrs. Fernández de Kirchner carried 21 of Argentina's twenty-three provinces, losing only in the City of Buenos Aires (to Carrió) and in the provinces of Córdoba and San Luis (which voted for Lavagna and Rodríguez Saá, respectively). This note links up with the coverage of the recent Polish elections as well as an accompanying analysis of the Polish economy with specific focus on the labour market. 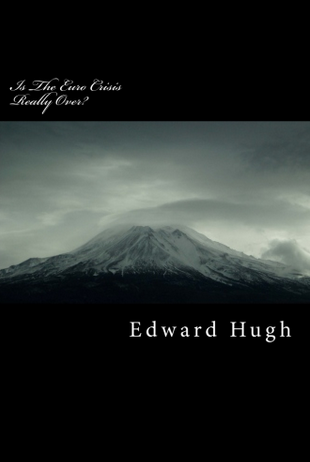 As such and as Edward also noted in his writings on the Polish economy I would be in hot on the heels with a look at indebtedness, capital flows and the current account balance situation. Now, I should say before we begin that I won't be looking much at indebtedness in this note but more so on the two latter topics. In this way it is also important to understand that the analysis applied to the Baltics in terms of a rigorous look at translation risk does not apply with the same degree to Poland. 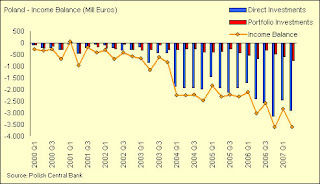 This does not mean that currency wobbles couldn't hit Poland; but for two principle reasons namely that the Polish Zloty is floating against the Euro as well as the fact that the run-up in credit and thus consumption and subsequent wage costs, although extensive, have not reached the proportions seen in the Baltics the situation is a little bit different in Poland. I should note however, that Poland only shines because in relative comparison with some of its CEE peers and that in general the economic fundamentals are rather shaky at this point in time. External positions in 2Q 07 in most EU8+2 were financed by FDI. In the Baltic countries they were financed by foreign borrowing through the banking sector. In most countries current account deficits remain largely covered by FDI – fully in the Czech Republic and Poland, in 90% in Bulgaria and 2/3 in Slovakia and Romania. Meanwhile in the Baltic countries, which have the largest imbalances, FDI cover 1/3 of CAD in Latvia and Estonia and slightly more (58%) in Lithuania with banking sector foreign borrowing remaining the primary source of financing. In the case of Poland we can see from the chart below that the net balance of FDI flows is virtually equal to the inflows which suggest that this pretty much is a run way street in Poland's case. At this point it can already be seen that an implicit narrative is emerging which revolves around how it is better to have your CA deficit covered by FDI than external credit extended by foreign banks and other financial intermediaries. In essence there is little practical sense in this claim in the sense that 'hot money' just as well may take the form of FDI and credit inflows and what really matters are factors such as expectations, policy choices, economic fundamentals etc. Yet, there does seem to be some fundamental economic reasoning to the claim in the sense that it would seem far easier for banking credit inflows to retreat in the very short term than for FDI. In this sense alone the positions held by the Baltic economies does seem to be more risky than Poland's. However, we must also consider the fact that FDI in essence is asset and return driven at all time horizons and since an economy's supply of investable assets and ability to create return depends on its capacity we run into the same problems in terms of the underlying economic fundamentals of most of the Eastern European economies. Yet, there may also be another aspect related to the inflow of FDI and thus foreign ownership of domestic assets. Essentially, I am talking about a steady build up of repatriation/collection of earnings and dividends from foreigners with assets in the domestic economy; such flows are measured on the income balance which measures the net gain Polish citizens earn on their investments abroad relative to what foreigners earn on their assets in Poland. 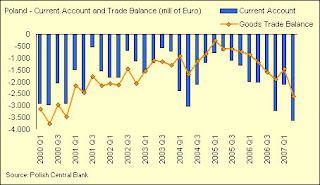 In order to see where this is going we can return to the chart above which plots the evolution of the overall current account balance. By performing a closer inspection there seem to be a breaking point around Q1 2004. Now, before this period the trade balance actually exceeded the current account deficit which means that something else had to be contributing to offset and thus make the CA deficit smaller. At this point we should not get too much into details here but in Poland's case this was offset by the service and current transfer balance. But what about the income balance then? Well, for the entire period in question (Q1,2000-Q2,2007) it was negative but take a look at the chart below and as such when things really began to run negative. 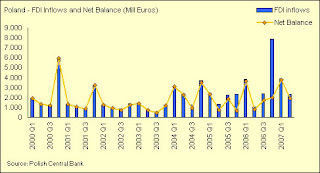 As can readily be seen Q1 2o04 does indeed seem to mark a breaking point and alongside a widening trade deficit it seems clear that the hefty decrease in the income balance has done its part to move the current account deficit into a firm negative territory at this point. Doesn't this leave us with a rather perverse conclusion with respect to the benefits of FDI? Unfortunately and as is often the case the devil is in the detail. In this way you can say that, all things equal, the FDI and income balance are often inter temporally negatively correlated (although of course many strides have been made to prove this claim false in the context of the dark matters of the US current accounts) Ok, let us put some words on this mumbo jumbo shall we. In essence it has already been partly explained above. When the FDI balance is positive and to the almost extreme extent it is in Poland it also means that while foreigners will have a lot of Polish assets on which to earn income Polish citizens have comparatively very few foreign assets on which to earn income. So, we can understand why this leads to a negative income balance, but does it also necessarily lead to an overall negative current account? This is where my dear reader we get to very heart of the problem in terms of the way the Polish external balance is moving and something which is likely to be the case in many other countries in the region; most emphatically Hungary. As such, the fact that you get a lot of FDI as an emerging market is not bad; in fact this is a good sign and essentially quite as we would expect on the basis of the classical economic growth theory (i.e. where capital enjoys a higher marginal productivity in less developed countries). 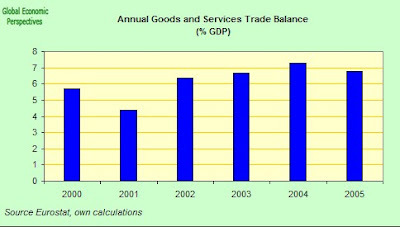 However, once we relate this to the evolution of the trade balance (in both goods and services) we can see that if the inward flows of FDI does not result in some kind of increasing export performance the deterioration in the income balance becomes just another ball-and-chain around the country's foot in the sense that it takes a comparatively much more vigorous boost in exports of goods and services to swing back into balance or just to keep the edifice from crumbling. This then also relates to the nature of FDI investments themselves which I won't go into here. But given the obvious underlying capacity problems which face Poland and many other countries the current trajectory needs to be watched. Ok, I am sorry that all this got a bit technical with respect to the formal functionings of the current account of an economy but I do hope that you have been able to take some important points away. Before I sign off, I have a couple of remarks. 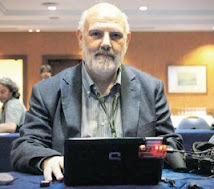 - First off and for all intent and purposes the analysis above is a hypothesis on the potential evolution of the external balance in the light of interconnected issues discussed. What we need to do now is to watch! - Secondly, FDI is not bad! In fact, inflows of FDI generally is a pretty good indicator for the relative attractiveness of the country's domestic assets and thus economy. Yet, when take into account the rather unique economic situation in Poland and the rest of Eastern Europe the factors above need to be watched. Slovenia, the most prosperous and northernmost of the former Yugoslav republics, holds a presidential election on Sunday, October 21, 2007. Outgoing President Janez Drnovšek is not running for re-election, and there are seven candidates for the largely ceremonial office. However, if none of them secures an absolute majority in Sunday's vote, a runoff election will be held between the top two contenders on November 11. Unlike other republics of the former Yugoslavia, Slovenia is ethnically homogeneous - Slovenes constitute ninety-one percent of the population, while Serbs account for only two percent - and the country attained nationhood with very little bloodshed. After having overwhelmingly voted in favor of independence in 1990, Slovenia declared its independence in 1991. Following a brief, ten-day war of independence with the Yugoslav People's Army, the country was internationally recognized in 1992. Slovenia was the first Yugoslav republic to hold a free election in 1990, and subsequently developed a Western European-style multi-party system in which the left-of-center Liberal Democracy of Slovenia (LDS) emerged as the country's largest political force. Save for six months in 2000, LDS ruled the country from 1992 to 2004 in a succession of coalition governments; party leader Janez Drnovšek served as prime minister from 1992 to 2000, and again from 2000 until 2002, when he was elected President, succeeding the popular Milan Kucan, a former Communist who had been Slovenia's head of state since 1990. In the 2004 election, the right-of-center Slovenian Democratic Party (SDS) displaced LDS as the largest party, and SDS leader Janez Janša formed a four-party coalition government. Voters decisively approved Slovenia's membership in the European Union (EU) and the North Atlantic Treaty Organization (NATO) in a 2003 referendum, and the country joined both organizations the following year. The national economy has grown strongly since independence, and in 2006 per capita Gross Domestic Product (GDP) stood at 87% of the EU average - well above other Eastern European member countries. In January 2007, Slovenia became the first EU member from Eastern Europe to adopt the Euro as its currency. Opinion polls have former prime minister Lojze Peterle of the center-right New Slovenia - Christian People's Party (NSi) ahead in the presidential race, but he remains well short of an absolute majority, and a runoff vote appears likely between Peterle and either Bank of Slovenia governor Mitja Gaspari or international law professor (and former UN ambassador) Danilo Türk. Gaspari - who presided over the successful introduction of the Euro - is backed by LDS, while Türk is supported by the left-wing Social Democrats (SD), the Democratic Pensioners' Party of Slovenia (DeSUS) and a group of independent, former LDS parliamentarians. Meanwhile, Zmago Jelinčič of the nationalist Slovenian National Party (SNS) is trailing in fourth place, but remains within striking distance of Gaspari and Türk. Slovenia's National Electoral Commission has 2007 presidential election results in Slovenian as well as English. Preliminary first round results left no doubt that there would be a runoff election, and that Lojze Peterle would be one of two candidates taking part in that vote, but it was initially unclear who his opponent would be, as less than 0.4% of the vote separated second- and third-place contenders Danilo Türk and Mitja Gaspari. However, final results confirmed preliminary figures which placed Danilo Türk in second place by just 3,717 votes over Mitja Gaspari. Despite his second-place finish in the first round of voting, Dr. Türk went on to win the November 11 runoff by a landslide victory, accurately predicted by opinion polls that gave him a lead of more than two-to-one over former prime minister Peterle. Well as the title of this post suggests, Slovenia - in the EU10 context - certainly is different. And it is different from its peers in a number of significant ways, some of which readers may find more surprising than others. One of the most obvious ways in which Slovenia is different is to be found in the fact that Slovenia uses the euro. As is by now pretty well known, on January 1, 2007, Slovenia officially joined the Eurozone and adopted the euro as its new currency. At the same time, Slovenian euro coins, which had been available inside Slovenia as a "starter kit" from December 15, became legal tender across the whole Eurozone. So much for stating the obvious. There is, however, another way in which Slovenia is - at least a little - different from the other EU 10 countries, and this difference is to be found in its demography. 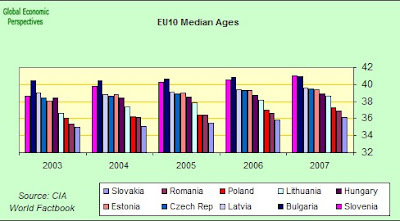 Slovenia is, in terms of its median population age, quite literally the oldest member of the EU10 group. 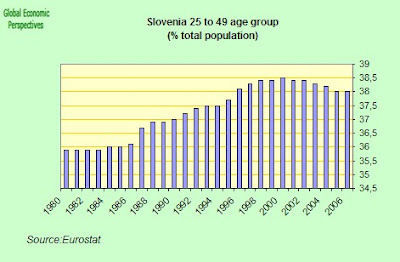 As can be seen, Slovenia's median age - which is now around 41 - has been rising quite rapidly in recent years, and as a consequence it has now the oldest member of the group, and is getting quite literally older by the day. As we will see below, this little detail is not exactly devoid of economic significance. The principal reason why Slovenia is somewhat older than the rest of the EU 10 - and why it is ageing comparatively more rapidly - is the greater life expectancy that Slovenians enjoy. 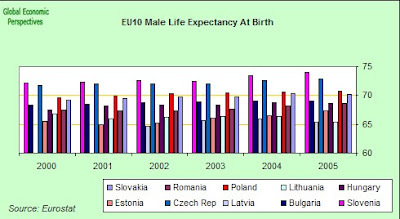 Below you can see male life expectancy at birth for all the EU10 countries. I have used male life expectancy here since the much higher male economic participation rates and levels of human capital formation among males in the over 50 group give male life expectancy a considerable importance, especially if your plan is - like that of the World Bank - to increase participation in the over 55 age group as a way of offsetting the impact of low fertility. 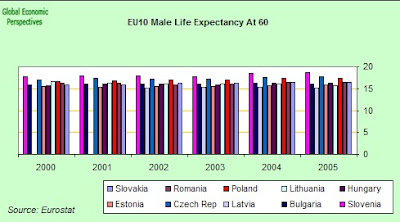 Of course this is not an "us against the rest" situation, and Slovenia is not alone in having rather longer life expectancy, the Czech Republic comes a close second, followed a little further back down the road by Poland and Slovakia. As we can see, even when we come to look at the male life expectancy at age 60 numbers, the Czech Republic and Slovenia stand out for being somewhat different from the rest of the group. And there is another dimension on which the countries of EU 10 may be separated one from another. Immigration. Some of the group are net recipients of migrants, which others, as is by now pretty well known, have been large scale sources of outward migration. What stands out here is the way some countries - in particular the Czech Republic, Hungary and Slovenia - have been receiving migrants while others have been losing them. And the data presented here (which is the official Eurostat data) substantially underestimates the losses in the out-migration countries). The data I present here for Romania is laughable, and by a large order of magnitude (as I explain here), and I haven't even bothered to present the data Bulgaria have submitted to Eurostat since it is an affront to our intelligence. But the general lack of care and attention from which this data seems to suffer is an important deficiency for the countries concerned since it must convert the interest rate setting procedure for the central bank into a complete comedy. How exactly do you estimate the inflationary consequences of any given level of interest rates when you do not even know how to within a reasonable order of magnitude how many people you really have inside the country and available for work - your potential "capacity" that is. Still, since this issue - despite the recent increase in interest among central bankers in topics like inflation targeting and Taylor rules - seems to worry virtually noone, so we will not lose time unduly by taking the matter further here, except by noting that, of course, in Bulgaria, due to their hard-peg with the euro, they effectively have no autonomous interest rate setting ability anyway, and this could be one of the reasons why the authorities there seem to demonstrate so little interest in finding out how just many of their citizens are in fact working abroad. Evidently they are quite content to continue with the party, until of course it can go on no longer. No Lynx, But A Solid Hare Perhaps? As defined by Claus in this post, Slovenia is not really one of the lynx economies, given its more moderate sprint velocity, but growth has been steady and solid all the same. This situation is not recent. Even though Slovenians comprised only about one-thirteenth of the total poulation of the ex-Yugoslavia, the republic was the most productive of those in the ex-Yugoslavia, accounting for one-fifth of its GDP and one-third of its exports. Thus on gaining independence in 1991, Slovenia already had relatively prosperous economy (in EU10 terms) and strong market ties to the West. So even if, in recent years, Slovenia's growth has not been so spectacular as that of some of its peers, it has been steady and solid, and in this sense there is much less possibility of Slovenia finding itself in the grips of a "boom-bust" cycle. Slovenia is in fact the most prosperous country in transition Europe and is well-poised to join the mainstream of modern developed economies. On many measures it has already advanced to the level of the other developed economies, and the expression emerging economy may already be something of a misnomer in the Slovenian case. Slovenia als benefits from a well-educated and productive work force, and its political and economic institutions are vigorous and effective. Its per capita income is now 86% of the EU average, and although Slovenians have taken a cautious, deliberative approach to economic management and reform, with heavy emphasis on achieving consensus before proceeding, the overall record is undoubtedly one of success. Despite the generally good productive record, there is some evidence that Slovenia has begun to lose competitiveness in recent years. 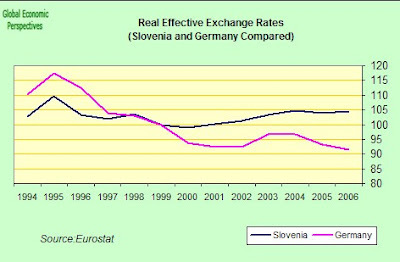 If we look at the evolution of the Real Effective Exchange Rate, and make a comparison with Germany (where, of course, very large efficiency savings have been made there since the mid 1990s), we can see that while in the late 1990s and the early years of this century Slovenia steadily became more competitive, in recent years this steady process of improvement has been arrested and the situation has started to deteriorate. And if we look at another measure of productivity - unit labour costs - we will see that the large improvements of yesteryear are now no longer being made (which is hardly surprising, since the more you close the gap, the more difficult it is to keep closing it). Nonetheless if Slovenia is the confront the challenges of the rapid ageing in the population which is about to occur, then this trend will need to be addressed and reversed. 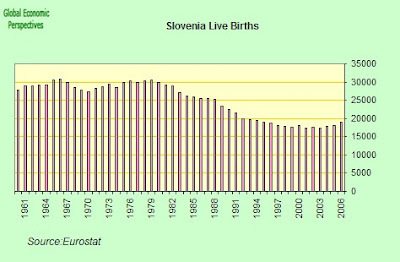 As has already been suggested, given the rather better initial position of Slovenia, and the rather more balanced pace of economic econvergence growth, Slovenia is at this point - and also helped by a steady instream of economic migrants - avoiding the worst excesses being produced by the growing labour scarcity phenomenon elsewhere. Unemployment is, nonetheless, coming down quite rapidly. This decrease in umeployment is, naturally enough, in large part due to a steady increase in the numbers of those employed, or, if you prefer, to a successful policy of job creation. But the end result, of course, is that the number of people available for work is declining steadily. In part this is other face of the coin of slowing productivity growth accompanied by accelerating GDP growth, what you don't get out of efficiency improvement you have to get out of increased factor inputs, in this case of labour. 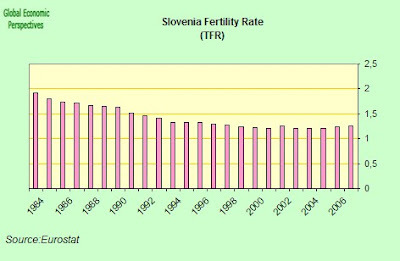 And this situation isn't going to improve anytime soon, if we look at Slovenia's long term fertility performance. As can be seen, Slovenia dropped below replacement fertility somewhat earlier than the other EU10 countries, probably around 1980. 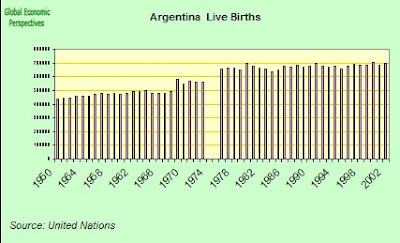 Alos the number of live births per annum peaked around the same time (ie with people who will now be nearly 30) at around 30,000 a year. By the mid 1990s this number was down to about 18,000, or under two thirds of the high point. This means that from now on the Slovenian labour market faces a diminishing number of potential entrants, and by a rather large percentage difference. If we now turn to wages, we can see that even though the levels of increase are in no way comparable to Baltic or Romanian ones, Slovenian wages are nevertheless rising steadily, and significantly beyond the level of productivity increase. Similarly, if we come to look at inflation in Slovenia, we will find that it is not big beer at this point, but that, in line with the other indicators we have been looking at, it has started to tick upwards in a way which may indicate trouble to come down the line, especially if growth remains vigourous. As could have been expected from looking at the real effective exchange rate data, the unit labour costs data, and the chart for wage and salary increases above, private consumption growth has been vigourous - though not exaggerated - in Slovenia in recent years, and has been a substantial driver of GDP growth. Not unsurprisingly, this steady but slight attrition of Slovenia's competitiveness does find its expression, and it is in the trade balance, which has deteriorated, even if ever so slightly. 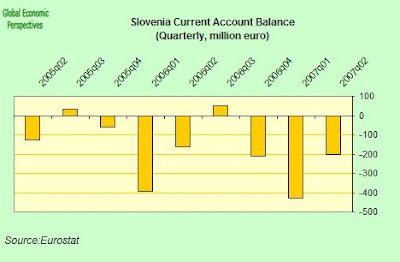 Slovenia, due in large measure to tourism, normally acheives a balance on services trade, which to some extent, but not completely serves to offset the significant deficit in goods. On the current account side the position is rather similar, that is it is midly preoccupying. At the end of the day all of this needs some contextualising. Nothing we have seen above is dramatically worrying, not at all. But the slow and steady deterioration in some of the indicators needs to be set against the rapid ageing which is taking place in Slovenia. If Slovenia follows the profile of othermore elderly societies - Germany, Japan, Italy - then we can expect the private consumption element to steadily lose its capacity to drive GDP growth, and Slovenia will need to become more and more reliant on exports. But to be able to rely on exports for growth Slovenia will need to reverse the loss of competitivity trend, it will, to put matters starkly, need to become like Germany. This situation becomes partricularly clear when we look at the chart for the 25 to 49 age group as a percentage of the total population. As can be seen this group "peaked" as a part of the population in 2000. The macroeconomics of why this age group is important, and why its peaking-out is a significant moment in economic terms is in fact rather straightforward. The moment of maximum 25-to-49 age group share could be thought of as the moment of maximum capacity and growth potential for any given economy. This is basically the case for two reasons. In the first place the 24 to 49 age group includes the crucial 25 to 49 household-former, first-time-homebuyer group. In terms of credit expansion, it is this group which drives a significant part of internal demand, since this is the group with the greatest propensity to borrow forward, and this is vital. The 25 to 49 age group also includes another important group for economic analysis, the 35 to 50 one. It is this group which drives an economy in productive terms, since these are the prime age workers. If you think of a society as a 100 metres sprint athlete, then there is an age when this athlete is at the maximum of his or her running potential, an age after which, and with the passage of time, they can only run the 100 metres more and more slowly. 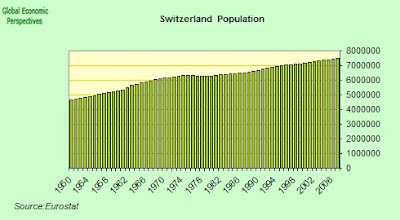 Well a society is the same in terms of its collective economic potential, after the 25 to 49 age group peaks an economy can only move forward more slowly, and evidently, unless the situation is addressed via either increased fertility or greater immigration, the pace becomes progressively slower as the 25 to 49 age group declines inexorably as a % of the total population. So, as I indicate above, Slovenia is at the crossroads. In some ways its most productive era is now coming to a close, and the hard part lies out in front: how to find the reources to pay for the pension and health systems which will be needed to sustain this ever more elderly population, and how to do it with an ever older, and ever smaller workforce. Is Slovenia to become more like Germany, or more like Italy. That is the question. The Swiss Confederation holds a federal parliamentary election on Sunday, October 21, 2007. Voters will choose 199 members of the 200-seat Nationalrat (National Council), the lower house of the Swiss Parliament; in the small canton of Nidwalden, the Free Democratic Party (FDP) candidate had no opponent and was declared elected last September 25. In addition, elections will take place for 41 of 46 seats in the Council of States, the upper house of Parliament; the cantons of Zug and Appenzell Innerrhoden elected their Council of States members in October 2006 and April 2007, respectively, while FDP and Christian Democratic People's Party (CVP) candidates were elected unopposed last month in the single-seat cantons of Obwalden and Nidwalden. Federal Elections in Switzerland - Elections to the Nationalrat (National Council) has further information on the country's electoral system, with parliamentary election results from 1971 to 2003. By Western European standards, voter turnout in Swiss parliamentary elections has been decidedly low for many years: since 1979, fewer than fifty percent of the electorate has taken part in successive National Council elections. In fact, among Western democracies only the United States has lower election turnout rates. Switzerland's low voter turnout in federal elections may be attributed to a variety of factors. First, the country has been ruled for nearly a half-century by a grand coalition of the four major parties - the conservative Swiss People's Party/Democratic Center Union (SVP/UDC), the left-of-center Social Democrats/Socialists (SPS/PSS), the centrist Free Democrats/Radical Democrats (FDP/PRD) and the center-right Christian Democrats (CVP/PDC); despite growing acrimony between them, it is very likely the same four parties will remain in power after the election. In other words, it is not anticipated the upcoming vote will bring about a change of government. Second, in Switzerland a popular referendum may be held over any bill voted by Parliament; only 50,000 signatures (just over one percent of the electorate) are required to call a referendum: the measure must then be passed by a double majority: a majority of voters in the entire country, and a majority of cantons (the federal states of Switzerland, which are endowed with considerable powers). Constitutional amendments must also be approved by voters. In fact, as little as 100,000 of these (around two percent of the electorate) can propose a constitutional amendment, which must be decided as well by popular referendum, after being debated in Parliament. As such, the electorate can veto any bill passed by Parliament, effectively diluting the power of the legislature. And third, in Switzerland nationwide referenda are usually held several times a year, resulting in electoral exhaustion; in fact, most referenda are characterized by low turnout rates as well. Nonetheless, it should be noted there were slight voter turnout increases in the 1999 and 2003 federal elections, after having hit an all-time low of 42.2% in 1995. For most of the 20th century, SPS/PSS, FDP/PRD and CVP/PDC had been Switzerland's three largest parties. However, in the 1999 and 2003 general elections SVP/UDC, until then country's perennial fourth party, made substantial gains at the expense of other right-wing and centrist parties, while the Free Democrats/Radical Democrats and the Christian Democrats declined noticeably. Opinion polls suggest SVP/UDC will remain the largest party, ahead of SPS/PSS, with FDP/PRD and CVP/PDC vying for third place. Meanwhile, the Green Party of Switzerland (GPS/PES) - the largest non-government party - stands to make substantial gains. As in the 2003 general election, SVP/UDC is running on a nationalist, anti-immigration platform, illustrated by a controversial campaign poster that shows three white sheep, one of which is kicking a black sheep off the Swiss flag; the poster's caption translates as "For Greater Security." In addition, the party is collecting signatures for an initiative to expel foreign criminals from the country. However, one event that could upset all predictions was the riot that took place in Bern last October 6, in which far-left groups disrupted a SVP rally. Although the United Nations' xenophobia watchdog has denounced the SVP/UDC campaign poster as openly racist, the violent incident in the Swiss capital could play to the rightist party's advantage. Complete election results published by the Swiss Federal Statistical Office's Elections 2007 website show both the right-wing Swiss People's Party/Democratic Center Union (SVP/UDC) and the environmentalist Green Party of Switzerland (GPS) made significant seat gains, mainly at the expense of the centrist Free Democratic Party/Radical Democratic Party (FDP/PRD) and the Social Democratic Party of Switzerland/Swiss Socialist Party, which lost considerable ground. Meanwhile, the Christian Democratic People's Party/Christian Democratic Party (CVP/PDC) picked up additional seats. With all twenty-six cantons reporting, the distribution of National Council seats in the 2007 federal election is as follows (figures in parentheses show gains or losses with respect to the 2003 federal election): SVP/UDC, 62 (+7); SPS/PSS, 43 (-9); FDP/PRD, 31 (-5); CVP/PDC, 31 (+3); GPS/PES, 20 (+7); Others, 13 (-3). Voter turnout increased to 48.3% - the highest in twenty years. While it's expected the four major parties will remain in grand coalition, the growth of the Green Party raises the possibility the party may seek representation in the Federal Council, Switzerland's seven-member collegiate presidency. That said, the Greens would need majority support in Parliament in order to secure a seat in the nation's governing body, and that seat would inevitably come at the expense of the other parties. With all the fuss there has been in the popular press of late about the so-called Japanese carry trade and its impact on global liquidity (not forgetting, of course, all that attention which has been lavished on those canny Japanese housewifes who seem to have been playing the global markets so well) one important element in this fascinating global phenomenon seems to be in danger of escaping people's notice: the Swiss connection. This post, which accompanies Manuel's electoral posting, will focus on the Swiss carry phenomenon, and will attempt to situate it in the context of the battery of stylised facts which now characterise economic activity in the fastest ageing of our developed societies. Among these now reasonably well established "facts on the ground" are features like weak domestic consumption, growing export dependence, and a generally low internal interest rate environment. As we shall see, these features appear to be just as representative of what has been happening in Switzerland as they are of Japan. Like Japan, Switzerland is a country which has been aging fairly rapidly in recent years. 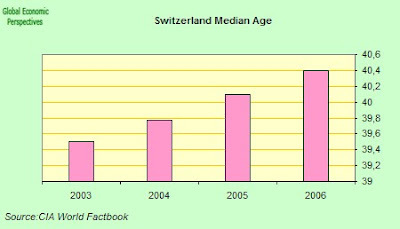 Switzerlands median age, although not yet up to the heady levels of Germany, Italy and Japan (each around 43) has been climbing steadily, and is currently somewhere around 40.4. This rising median age is the product of both 35+ years of sustained below-relacement fertiliy, and a steadily rising life expectancy. 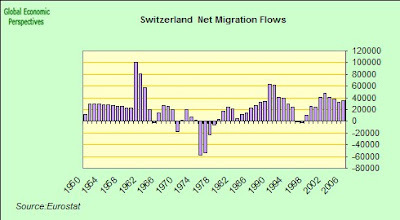 Switzerland has also had a reasonable inward flow of migrants in relation to its total population over the last decade, with around 35,000 - 40,000 people settling in the country annually. 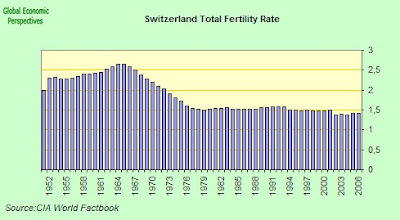 The end product of the inward migration and greater life expectancy is that, despite very low fertility rates over a long period of time, the Swiss population still continues to rise slowly, even while it ages. 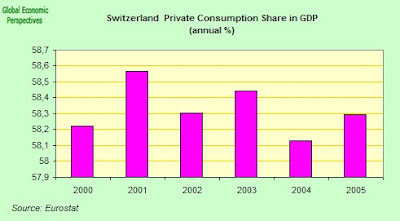 Well, if we now come to examine the economic implications of this long term demographic transformation that is taking place in Switzerland, it should not surprise us at all to find that, as in the case of other elderly societies like Germany and Japan, domestic consumption is now no longer an especially strong driver of GDP growth, and exports have to take a growing share of the weight. Actually GDP growth has been neither exceptionally stellar nor exceptionally poor in Switzerland, and since the start of the century it has averaged in the region of a 1.9% annual rate. 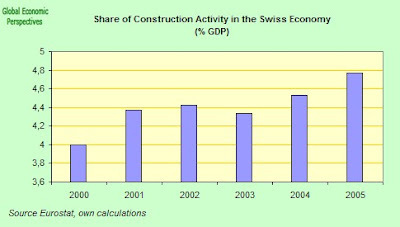 The consumption share in Swiss GDP is way below the levels in the construction boom societies like Spain, Ireland, the United States or Australia, and has remained reasonably constant at around 58% share. The actual annual rate of growth in private consumption has, since the early ninetees, been very weak, averaging only 0.9% per year since 1990. 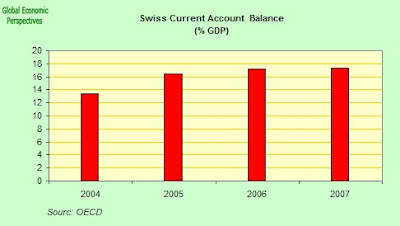 Switzerland also runs a very large and substantial current account surplus too. Obviously, looking at the above chart it isn't hard to note the impact of the "financial turmoil" which set in in mid August, but which now, in the case of the Swiss banking sector, seems to have more or less calmed down again (something which may not be said of the eurozone banking sector at this point). If we look at a longer-term time series, we will see that between 2002 and 2006 Swiss interest rates were incredibly low, in a way which is amazingly reminiscent of the recent path Japanese interest rates. As I have attempted to argue above, this similarity between Switzerland and Japan may be rather more than incidental since the underlying demographic profile is not that disimmilar. 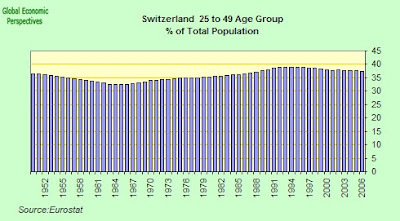 If we look at a chart for the key 25 to 49 age group, we will see that in Switzerland this group "peaked out" at around 39% of the total population between 1992 and 1995, and has been declining steadily in relative importance since that time. Well, going back to our central topic here, which is, let us not forget, the role of Switzerlands low interest rates in stimulating a carry trade, and the impact of this carry trade in the Emerging Economies in Eastern Europe, what we need to note is that there has been a growing tendency in some parts of Central and Eastern Europe - and especially since the turn of the century - to contract loans which are denominated in Swiss Francs. What now follows is a brief account of what we know about the current extent of this phenomenon, and about the prominent role which the Austrian banking sector seems to play in it . At the end of the post I return to the issue of Switzerland as an elderly economy with specific structural problems, problems which lead Switzerland to play such a leading role - one is both distict from yet similar to that played by Japan - in the carry trade phenomenon. The use of Swiss franc denominated loans has become a widespread phenomenon in Eastern Europe. In Hungary, to take one important example, over 80% of all new home loans and half of small business credits taken out since early 2006 have been in Swiss francs. A similar pattern of heavy dependence on foreign currency denominated loans is to be found in Croatia, Romania, Poland, and the Baltic States, although the mix between francs, euros, and the yen varies from country to country. The fashion for borrowing in Swiss francs really took off in Eastern Europe when Swiss National Bank dropped interest rates to 0.75% in order to stave-off a perceived deflation threat, turning Switzerland in the process into the cheapest source of loan capital in Europe. External lending in Swiss francs reached $643 billion in 2006, according to data from the Bank for International Settlements . 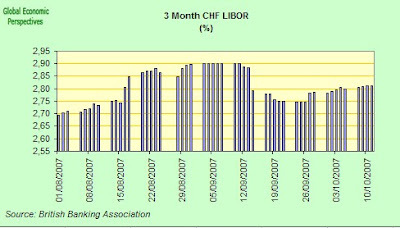 The huge scale of the borrowing in fact drove the Swiss franc to a nine-year low against the euro, and has lead to an accelerating slide in its value over the last two years - even though by this point the Swiss National Bank had been busy raising rates (Swiss interest rates have now been increased 7 times since the 2003 trough). The extreme weakness in the Swiss Franc is in fact rather perverse (shades of Japan, of course, here), since currently Switzerland enjoys the highest current account surplus in the developed world (some 17.7% of GDP in 2006). At the same time the Swiss hold more than $500 billion in net foreign assets, making them in these terms the wealthiest nation on earth. Total cross-border claims of BIS reporting banks expanded by $1 trillion in the last quarter of 2006. After more modest growth in mid-2006, a pickup in interbank claims accounted for 54% of this expansion. A surge in credit to nonbank entities contributed $473 billion, pushing the stock of cross-border claims to $26 trillion, 18% higher than in late 2005. The flow of credit to emerging markets reached new heights through the year 2006. Claims on emerging markets grew by $96 billion in the final quarter of 2006, bringing the volume of new credit throughout the year to $341 billion. This amount exceeded previous peaks ($232 billion in 2005 and $134 billion in 1996), both in nominal value and in terms of growth. The current annual growth rate has risen to 24%, having surpassed for the sixth consecutive quarter the previous peak of 17% recorded in early 1997. Emerging Europe overtook emerging Asia as the region to which BIS reporting banks extend the greatest share of credit. Since 2002, growth in claims on the region has consistently outpaced that vis-à-vis other regions. With a record quarterly inflow, emerging Europe received over 60% of new credit to emerging markets, bringing its share in the stock of emerging market claims to 34%. Less of the new credit went to the major borrowers (Russia, Turkey, Poland and Hungary) than to a number of smaller markets, notably Romania and Malta, as well as Ukraine, Cyprus, Bulgaria and the Baltic states. The currency denomination of cross-border claims on emerging Europe tilted further towards the euro. In the stock of claims outstanding, the euro and dollar shares were 44% and 31%, respectively, but the gap in the latest flow data was more pronounced (61% and 5%). While the sterling share has remained close to 1%, the yen has lost ground to the Swiss franc, thus continuing a trend seen over the last six years. Yet there is little evidence in the cross-border data of unusual borrowing in Swiss francs that might correspond to Swiss franc-denominated retail lending in several countries. Borrowing in the Swiss currency remains on average below 4% of cross-border claims, and exceeds 10% only in Croatia and Hungary. Nearly 20% of reporting banks’ foreign claims were in the form of funds channelled to emerging market borrowers. Claims on residents of emerging Europe continued to account for the largest share of these funds. 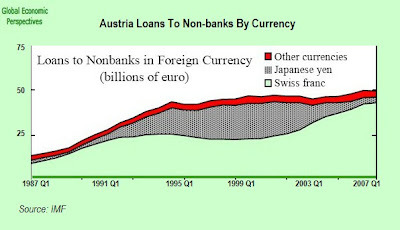 So, although the BIS find "little evidence in the cross-border data of unusual borrowing in Swiss francs that might correspond to Swiss franc-denominated retail lending", they do make an exception in the cases of Hungary and Croatia, where they note that lending in Swiss francs to retail clients reaches over 10% of the total retail loans in those countries, and indeed, as I indicate above, swiss franc loans now seem to account for over 80% of new housing related credit in Hungary. In our case, the strategy is pursued by private borrowers, often farmers it is said, who raise loans in Swiss francs rather than in Danish kroner. A lower level of interest rates for Swiss than for Danish instruments makes this advantageous, at any rate for as long as the Swiss franc does not strengthen excessively against the krone. 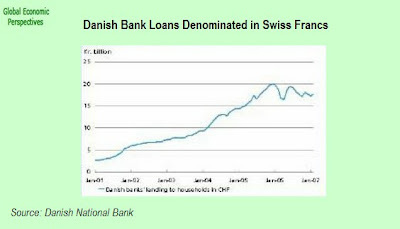 The banks’ lending to households in Swiss francs has risen steadily since 2001 and today totals almost kr. 20 billion. 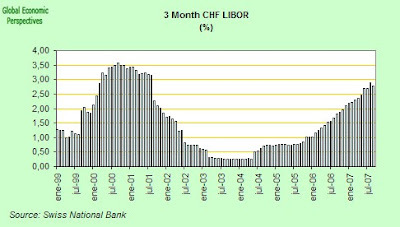 During 2006 the increase in Swiss franc lending flattened out, however, and by the end of the year the net lending was negative. At the same time, the Swiss franc had weakened to its lowest level against the Danish krone for 8-9 years. The decline in net lending may be due to expectations that the Swiss franc would rally. This is confirmed by statistical analyses of data for a large number of years. The analyses find significant correlation between a weaker Swiss franc and diminishing net lending. It is interesting that the Danish carry speculators show a different reaction pattern to the yen carry speculators. The yen carry speculators leave their positions when the yen strengthens, apparently fearing that the strengthening forewarns an imminent stronger adjustment of the exchange rate. Our domestic Swiss franc speculators increase their positions when the franc strengthens, apparently believing the strengthening to be temporary. 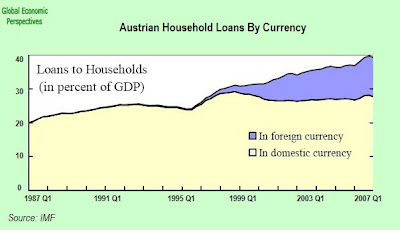 Following years of relative stability, foreign currency loans to Austrian households entered a phase of explosive growth around 1995. Even though their growth has moderated since 2001, foreign currency loans still account for about half the growth of total credit to households. By end-March 2005, 30 percent of outstanding loans to households were in foreign currency, compared with about 5 percent for the euro zone. Nearly all these loans are in Swiss francs and, to a lesser extent, Japanese yen. The vast majority of these loans finance domestic transactions. 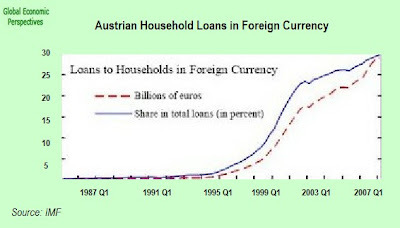 The popularity of foreign currency loans among households is a uniquely Austrian phenomenon in the euro zone. In the second place, annual growth rates for these loans spiked sharply at the turn of the century and since that time the rate of arrival of new demand has declined significantly (this turning point coincides, of course, with the introduction of the euro, and interestingly enough Denmark is not part of the eurosystem). The boom in these loans appears to be reflecting currency substitution rather than a lending boom. Growth of credit to households (in all currencies) has been relatively subdued (second panel of Figure 1), suggesting that a considerable part of the growth of foreign currency loans has been the result of refinancing. Indeed, because of refinancing of previous schilling or euro loans, the contribution of foreign currency loans to the annual growth of total loans to households approached or exceeded 100 percent in six consecutive quarters beginning in late 1998. Another interesting question to ask is just how did all of this got started, since evidently there may be lessons here for the spread of such practices in the East of Europe, and, of course, the fact that chart for the growth of foreign currency denominated loans is surprisingly reminiscent of the sort of S shaped curves which were so evident in the spread of the use of mobile phones is very revealing. The practice of borrowing in foreign currency (mainly Swiss francs) began in the western part of the country, where tens of thousands of Austrians commute to work in Switzerland and Liechtenstein. 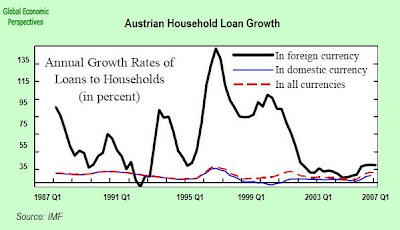 This partly explains why the share of these loans was higher in Austria, even during the 1980s. Word of mouth and aggressive promotion by financial advisors helped spread the popularity of these loans to the rest of the country. By the mid-1990s, newspaper ads placed by banks began to appear, fueling public interest (text figure). Another factor facilitating the spread of these loans could be the belief in the stability of the exchange rate deriving from Austria’s hard currency policy (a peg of the schilling to the deutsche mark) since 1980.6 The success of this policy may have created a psychology of an exchange rate immune from risks, notwithstanding the appreciation of the Japanese yen and, to a lesser extent, the Swiss franc since the mid-1980s. Austrian banks play a major role in many countries in Central, Eastern, and Southeastern Europe (CESE). Almost all of the large Austrian banking groups have subsidiaries in several countries in CESE. In quite a few cases, these subsidiaries are large compared with the host country’s financial systems. Moreover, some of these subsidiaries would probably be judged to be of systemic importance to the financial systems in the host countries. At the same time, the holdings in the CESE are important for the Austrian banks, as they represent a significant part of total assets and provide a major contribution to overall profitability. In other words the Austrian banks have leveraged expertise they developed for external currency loans based on an initial wave of domestic demand to gain a comparative advantage in a much larger market. The Austrian financial system is dominated by the banking sector. At roughly 300 percent of GDP, total banking sector assets are far larger than those of insurance companies and pension funds. Mutual fund assets and stock market valuation have increased considerably over the last five years, but also remain small compared with the banking sector. Domestic credit provided by Austrian banks is in line with levels elsewhere in Europe. In the early 1990s, Austrian banks were among the first to enter the Central and Eastern European (CEE) market. During that period, driven by geographical proximity, historical ties, and a saturated domestic market, most of the larger Austrian banks moved into the region. Generally, expansion started in Hungary and (then) Czechoslovakia. From there on, expansion continued, and currently comprises virtually all CEE markets. More recently, Austrian banks have entered Southeastern Europe and the CIS. 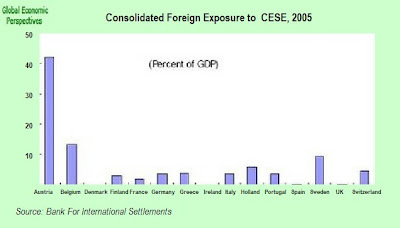 Between 2003 and 2005, their expansion led to increases in domestic market shares in almost all of CESE, with the increases in Romania and Bosnia and Herzegovina especially large. Some Austrian banks have expanded further east by entering the market in some of the CIS countries, most notably in Russia and Ukraine. 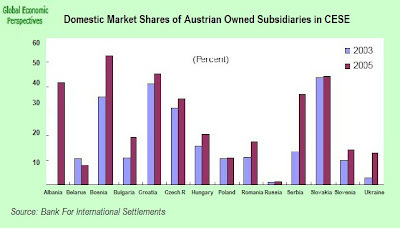 As a consequence, Austrian banks now own subsidiaries that are of key importance in several of the host countries in CESE. Even though Austrian banks are not large by international standards, their CESE subsidiaries are of considerable size. As the host countries are emerging markets, their financial systems are generally small by international comparison, and their financial markets are still deepening. As a consequence, some of the Austrian-owned subsidiaries are large in relation to the size of the financial systems of the host countries and could be considered of systemic importance. "The full force of aging is projected to be felt from 2015 onward." The rapid increase in the number of pensioners in relation to the working-age population has been remarkable. This is related to the increasing generosity of the social security system, not aging itself, and the tendency to contain long-term unemployment during the protracted stagnation of the 1990s. Since 1990, the number of pensioners increased by 35 percent while persons over 65 by only 17 percent. Still, early retirement has been less prevalent in Switzerland than in other industrial countries. 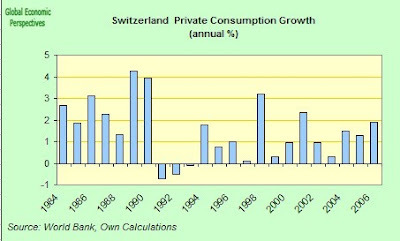 In fact GDP growth rates in Switzerland appear to have peaked in the 1980's at an average rate of 2.1%. 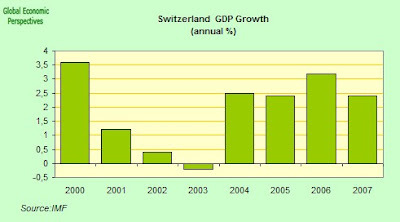 In the 1990s Switzerland's GDP grew at an average rate of 1.1%, and between 2000 and 2004 GDP growth averaged 1.3% annually. A similar pattern can be seen in the total number of hours worked, which rose at an annual average rate of 1.1% in the 1980s, falling to a 0.1% annual rate of increase in the 1990s and FELL by an annual rate of 0.1% in the 2000 to 2004 period. "the thrifty Swiss households save about 10 percent of their disposable income and also have accumulated significant private assets." At this stage of my analysis quite what element in this saving is population age-related, and quite what is cultural-behavioural is far from clear. This is a theme I will try to follow up on as and when time permits. In the meantime what I have tried to draw attention to in this post is the situation vis-a-vis the Swiss Franc carry trade in Eastern and Central Europe, the role and exposure of Austrian banks in this trade, and the striking feature that Switzerland is a fairly "elderly" society. In this context the comparison with Japan simply jumps out at you. Now, as I have said above, these two economies are at one and the same time similar and different (in terms of the structural features they present). All that can be prudently said here is that what has actually been going on in Switzerland in recent years bears closer examination to try to discover what may be learnt. Is Estonia Really Heading For A 'SoftLanding'? Is the ECB's Playbook too Thin?